The Katsina State House of Assembly during a budget presentation by Governor Aminu Masari on October 29, 2018. The Katsina State government has proposed a total of N200 billion for the 2019 fiscal year. 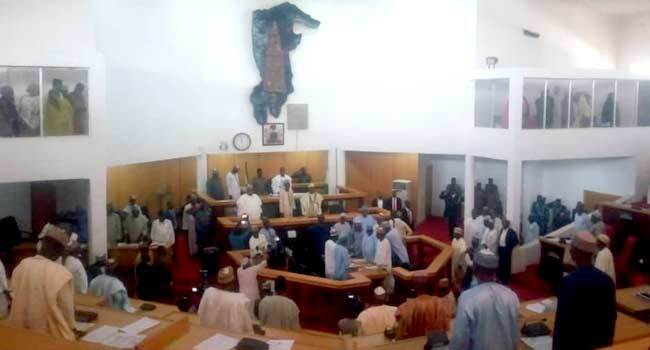 Governor Aminu Masari made the disclosure when he presented the 2019 Appropriation Bill to members of the Katsina State House of Assembly on Monday in the state capital. The proposal tagged ‘Budget of Stabilisation, according to the governor, is designed to stabilise restoration plans, programmes, and policies of the present administration. Critical sectors such as education and health received N19 billion and N20 billion allocation respectively. Similarly, environment, road, water, and agriculture were allocated N24billion, N20billion, N12billion, and N10billion respectively, representing 73 per cent of the total budget. Of the total sum, N148 billion is allocated for the capital expenditure while the recurrent expenditure gulps N52 billion. The 2018 budget estimate is in the sum of N211,497,191,095, comprising 70 per cent capital expenditure and 24.3 per cent recurrent expenditure. The post Masari Presents N200bn Budget To Katsina Lawmakers appeared first on Channels Television.